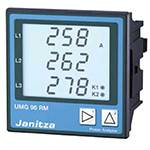 Janitza a German enterprise was founded in 1961 and is since almost 50 years active in the field of development and production of systems for efficient usage of electricity, energy measurement and cost reduction. Janitza electronics GmbH is nowadays globally well known as supplier of smart energy management systems, energy measurement devices, power analyzers, digital panel mounted multi meters, power factor controllers, and power quality solutions, such as PFC-systems and harmonic filters. Tremendous experience gained over decades and countless of power quality-, power management - and load management - solutions supplied during this period all around the world to top class are speaking for themselves.